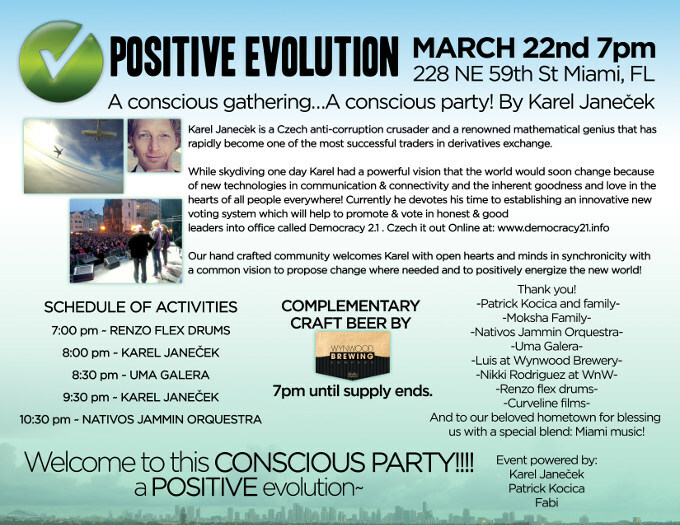 A conscious gathering… A conscious party! Karel Janecek is a Czech anit-corruption crusader and a renowned mathematical genius that has rapidly become one of the most successful traders in derivatives exchange. While skydiving one day Karel had a powerful vision that the world would soon change because of new technologies in the communication and connectivity and the inherent goodness and love in the hearts of all people everywhere! Currently he devotes his time to establishing an innovative new voting system which will help to promote & vote in honest & good leaders into office called Democracy 21. Our hand crafted community welcomes Karel with open hearts and minds in synchronicity with a common vision to propose change where needed and to positively energize the new world! us with a special blend: Miami Music! Welcome to this CONSCIOUS PARTY!!! !